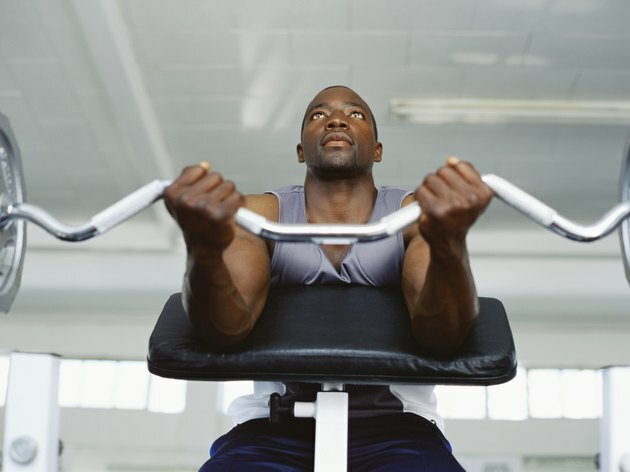 Bodybuilders try to gain as much muscle as possible while keeping gain of body-fat to a minimum. Two commonly consumed protein sources in bodybuilding are chicken and turkey. These lean meats provide important proteins for muscle growth while being relatively low in caloric content when compared to other meats such as beef and pork. While the differences between chicken and turkey are minimal, the edge goes to turkey. Chicken can still be a part of a bodybuilder's diet. Pre-contest, bodybuilders try to decrease their body-fat as much as possible. This means eating fewer calories while trying to keep protein intake high. According to Marie Dunford, author of "Nutrition for Sport and Exercise," strength-based athletes require a total of 1.5 to 2.0 g per kilogram of their weight a day of protein for optimal muscle growth. To find your protein intake needs, divide your body weight in pounds by 2.2 to get your weight in kilograms. Then multiple by 1.5 and 2.0 to get your required range. For a 220-lb. bodybuilder, this means 150 g to 200 g of daily protein intake. Typically, bodybuilders should eat the leanest cut of turkey, which is boneless, skinless turkey breast. Removing the skin from the turkey subtracts a great deal of fat from the food. This keeps the caloric content low. A 1-lb. serving of skinless, boneless turkey breast contains just 123 calories. There are 27 g of protein per serving and just 0.72 g of fat. Turkey can also be relatively inexpensive, especially between Thanksgiving and the New Year. However, boneless, skinless cuts of turkey breast are harder to find in the grocery store and may require you to ask a butcher for help. While turkey has a slight edge from a nutritional standpoint, the price of chicken is more stable year-round, and boneless, skinless cuts of turkey breast can be found easily at most grocery stores. Again, the removal of the skin reduces the calories. A 1-lb. serving of skinless, boneless chicken breast contains 135 calories per serving, which is 12 calories higher than the same serving of turkey. The ratio of protein to fat is also slightly lower than turkey with 25 g of protein and 3 g of fat per serving. Another important consideration is the amino acid profiles or each meat. Amino acids are the building blocks of proteins, and different amino acids have different effects on muscle gain. Specifically, the branched chain amino acids, or BCAAs -- isoleucine, leucine and valine -- are linked to optimal muscular growth and repair. Again, turkey is slightly superior to chicken in its content of BCAAs. One serving of turkey contains 1,420 mg of isoleucine, 2,176 mg of leucine and 1,451 mg of valine. A serving of chicken contains 1,230 mg of isoleucine, 2,073 mg of leucine and 1,297 mg of valine. Is Pork Better Than Beef?